I have to admit, this one made my hubby smile with delight. 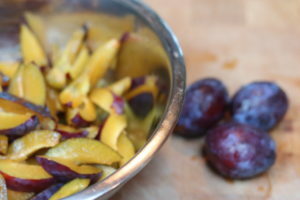 He loves baked fruit and we had quite a bit of Italian plums from our trees on Orcas Island. 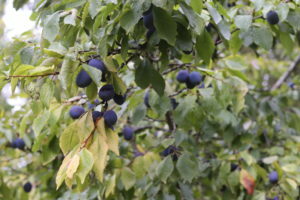 The plum season is very short and we rarely overlap when the fruit becomes ripe. This year, we were lucky and I harvested 8-10 pounds of fruit (that I could reach) and needed to find delicious ways to use them. I created a Tomato and Plum salad with a Za’atar spiced dressing and I made numerous plum crumbles, galettes, and fruit salads. This version of a crumble is gluten-free, using gluten-free flour and gluten-free oats. I also substituted sugar for grade b maple syrup which is darker in color and bolder in flavor. If you can find it, keep it in your pantry for special uses such as this. Paired with my Healthy On You® “Spice Spice Baby” Asian 6 Spice blend its a fantastic combo for crumble filling. Add the flour, sugar, oats, cinnamon and sea salt to a bowl and mix together. Add the butter and mix until it is incorporated and you have coarse-grainy pea-sized pieces of dough. Add the plums, maple syrup, Healthy On You® Spice, Spice Baby spice blend, and cornstarch to a bowl and stir well. 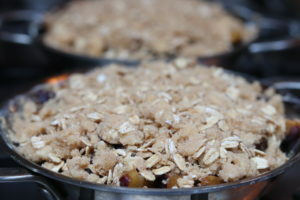 Add the mixture to a deep pie dish and top with the prepared crumble mixture. Bake in the oven for 45 minutes to 1 hour. The pie is ready when the topping is brown and the juices are bubbling. Note: You may want to place your pie dish on a lined baking sheet in case of overflows. Clean up will be a breeze.